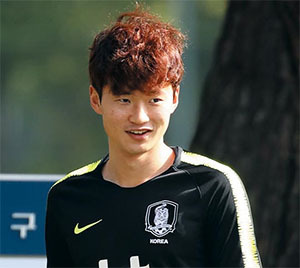 The Korea Football Association on Tuesday announced the list of players who will participate in the national team's training camp starting next week in Ulsan. They will hold training sessions to prepare for next month's AFC Asian Cup in the UAE. Footballers playing in Europe or the Middle East were excluded from the list, which mostly consisted of those playing in Asia. Defender Kim Jin-su is among them. It will be the first time for injury-stricken Kim to play under national team coach Paulo Bento. In March, he damaged a ligament in his left knee during a friendly against Northern Ireland, causing him to miss the World Cup in Russia last summer. He also missed the 2014 World Cup in Brazil due to an injury, after hurting his ankle. After completing a long rehabilitation, Kim made a successful return to Jeonbuk Hyundai Motors' starting lineup last month, showing off his trademark attacking style. His goal is now to play in the 2022 World Cup in Qatar. "I can't get hurt again," he said. "I'll do my best to play in the one in Qatar because it will be my last chance to do so, as I'll be close to 30 by that time." The 23-man roster for the Asian Cup will be announced on Dec. 20, and the squad will leave for the UAE on Dec. 23. The Asian Cup tournament will be held from Jan. 5 to Feb. 1.